Is Saul Alvarez the Real Deal? You might have noticed that we've had a poll up about Saul Alvarez for the last week. This was following the twenty-one year old's convincing win over Sugar Shane a couple of weeks ago, where Alvarez looked sharp and strong, and at points looked like he could have finished the fight with a KO. With forty-wins and a world title at such a young age, it's easy to get carried away with Canelo Alvarez hype. But despite all that we hear about him, the WBC champion is still lacking a major test and we don't know how well he measures up on the pound for pound ladder. 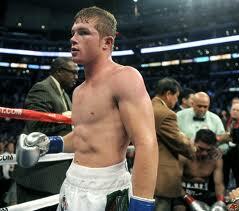 I thought it would be good to get your opinion on it, so we put up a Saul Alvarez poll to get your thoughts. We asked the question: "Is Saul Alvarez the Real Deal?". The two answers to choose from were: "Future Hall-of-Famer" and "Loss Waiting to Happen". So without further ado, here is the Punchbag Blog verdict of Saul Alvarez, chosen by our readers. The Punchbag Blog verdict: Saul Alvarez is a future Hall of Fame fighter. Let's see how right that proves, but until then, there's a new poll up on the right-side of the site.